Wes Anderson is one of the biggest directors working in Hollywood today. 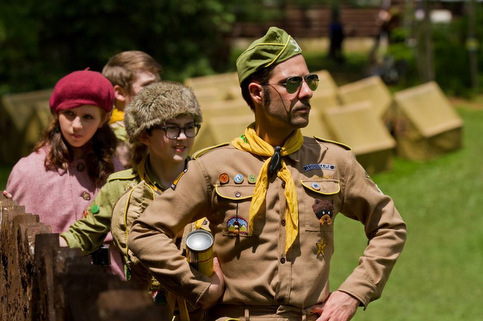 With classics like Rushmore, The Royal Tenenbaums, and The Life Aquatic With Steve Zissou under his belt, it was a pretty good bet that his newest film — Moonrise Kingdom — would be a hit. And it is. Having seen the movie, I can’t recommend it highly enough. I recently caught up with the film’s co-stars — Jared Gilman and Kara Hayward — and we talked about their first feature film, working with Bill Murray, and their favorite music. MYSPACE: So are you sick doing all these interviews yet? JARED GILMAN: It’s fun. I like it. KARA HAYWARD: I kind of enjoy it. I think it’s a lot of fun. So, I mean this whole experience must be pretty cool for you, you know. Your first film you got to work with Wes Anderson and all these amazing actors, and go to Cannes. Some people work their careers and don’t get to that point. JARED GILMAN: It’s really amazing. It’s really, I feel so honored and just to be here right now, I just feel so lucky. It’s great. KARA HAYWARD: It’s been so much fun. It’s an honor and a blessing to be here and to have worked with such an amazing cast and crew. And just everyone was so fantastic. What was the experience of the Cannes Film Festival like? JARED GILMAN: Cannes was awesome. It was so cool. I could go on for hours and hours talking about it. Cannes, but, something I just really loved was just getting to know that just my movie finished. Seeing Moonrise finished. And in front of an audience like over 2,000 people, that’s also incredible. I also went up on like they had us go on stage and officially declared the Cannes Film Festival. And that was, that was a lot of fun. It was huge. Now had you heard of Wes before you did this movie? JARED GILMAN: I had. I had seen Fantastic Mr. Fox. And I really, I really loved Fantastic Mr. Fox, so I really wanted to see his own movies. By now, obviously by now I’ve seen every, I’ve seen every one of his films, yeah. KARA HAYWARD: I actually, I have. By chance I had watched Fantastic Mr. Fox, the Darjeeling Limited, and Royal Tenenbaums. So, it was like fate (laughs) I guess to do this movie. And which one is your favorite, not including Moonrise Kingdom? JARED GILMAN: That’s a good question. I’ve … they’re all really great. It’s hard to really pick a favorite. 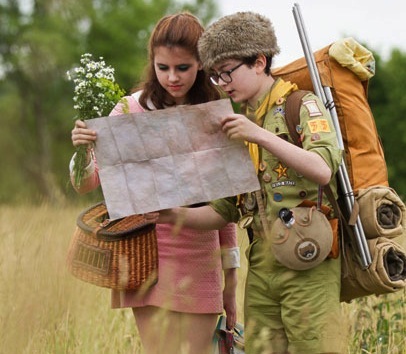 KARA HAYWARD: After Moonrise, I would really have to say The Darjeeling Limited, and Fantastic Mr. Fox, those were great. Okay. And now so what was the audition process like for this movie? JARED GILMAN: Well I had my first audition back in September of 2010 and then about six months later and three call backs, I, on March 1st my mom just picked me up from school which she never does. And over her Bluetooth my dad told me that I got the part. 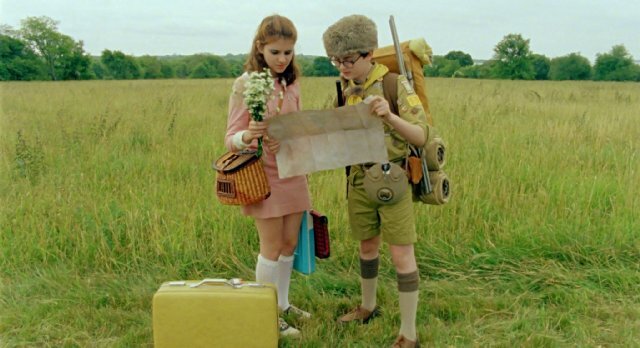 KARA HAYWARD: It started when my dance teacher told me about an open call for Moonrise Kingdom that was going on near where I lived. And so I figured I try it for fun. And so after I went, I got a call saying, we would like you to meet Wes Anderson. So after I met Wes about another week later I got a call saying you have the job. So how did you guys prepare for this role? JARED GILMAN: Sure. Like before filming, like the month before, they had Kara and I go to Rhode Island and we did rehearsals. And just to kind of test our chemistry. He also had me do canoeing lessons and cooking over an open fire lessons so I could flip, fish flipping lessons. And I also did some physical training. He had me watch this movie Escape From Alcatraz. ‘Cause he said that the characters are kind of similar, like Clint Eastwood character and mine are a bit similar in the sense that we’re both very resourceful and capable. He also had Kara and I write the letters that you see in the movie. The Dear Sam, Suzy letters. Except we would complete them and we e-mail them to each other. Then about midway through you kind of realize that I’m actually doing real snail mail and like writing them to each other, that would probably be a bit better than e-mail. So we restarted and we did. And I have to say it really help. Kind of get us to know each other a bit better and get us into our characters. And also just get into that 1960s vibe. KARA HAYWARD: Well, much prior to filming Wes would have myself and Jared Gilman go down to Rhode Island to do rehearsals and just go over lines and scenes. And so in a way that was definitely one of the things that prepared me. He also had me watch a film called Melody which was really lovely. Just to get ideas about my character. And he had all the scout troops go down and watch the film Black Jack. More ideas about the characters. And lastly, he had us write letters, the Dear Sam, Dear Suzy. He would have us finish those and mail them to each other. So what did you guys write about in the letters? JARED GILMAN: Basically just like what you see in the movie, except we completed them. KARA HAYWARD: Well, we would reference the script. And we would look back and just try and write from the character’s point of view. Just the way, and their voice the things that we think they would say. And now did you get to keep anything cool or interesting? Did you get a costume or anything like that? KARA HAYWARD: I got to keep my character’s kitten. Whoa, that’s pretty special. I mean usually get like a costume or a trinket. That’s pretty awesome. JARED GILMAN: I didn’t get to keep, I didn’t really keep anything. You didn’t try to sneak anything? JARED GILMAN: No. I’m a good boy. Although recently they did give me and my backpack. Yeah, it was backpack like you see in the movie and yeah. Gino was awesome though. Gino is, when she named the cat Gino, and it’s usually funny how like this cat, like wouldn’t, when like the camera was on, he would just completely ignore whatever he was doing and just get into character. And like be calm and stuff. Like we kind of had like this nickname for him. Like we would call him Gino Diva at one point. Just like, he was really how he worked. And now, so who was the funniest person on set out of all the wonderful actors and actresses you got to work with? KARA HAYWARD: They were all really funny. I think one of the people to point out in this case is Bill Murray. He is hysterical on the screen and off screen. He is just so funny and happy and everyone loves him. You can’t help it. He’s amazing. JARED GILMAN: Funniest? I mean they all had a great sense of humor. But Bill was hilarious. He was just like really funny. He’s, no matter what he could always make a joke and it was, he was great. Do you have a specific story about how funny he is? JARED GILMAN: Well, he taught me how to tie a tie. Which is pretty cool. I was doing a costume fitting for a costume in which I had to wear a tie. And at the time I had no idea how to tie a tie. ‘Cause I rarely ever had to wear a tie. And in fact, the first time I ever saw a tie I started screaming and ran around he house yelling, no tie, no tie. Yeah. And of course all of the people in the room they were women. So they didn’t know either. And Bill just happened to be right there. And he looked over at me and Jared, he said Jared, come over here, I’ll teach you. So I went over to him and he taught me how to tie a tie. KARA HAYWARD: Well, I actually happened to do a photo shoot with him one time. And they put a giant tuba on his head and he started playing. He was, we had so much fun together. He actually got a bit of tune going with that, with the tuba. And they gave him a guitar and he started to play. He was very good too. That was a bit of a surprise, I didn’t know that. Okay. And now do you have something either funny or interesting about Kara that we might not know? JARED GILMAN: Well, I mean she is, she’s very nice and she’s very easy to work with. Well, she told she’s a member of Mensa, that school. And is there something maybe funny or interesting about Jared that you learned on set? KARA HAYWARD: He loves to make his own home movies. He takes a little camera, and he likes to act in them. He writes them and directs them. And he has a lot of fun with that. KARA HAYWARD: I really, I like a wide variety of music. I’m kind of a being of everything from Aerosmith to Francoise Hardy, who they actually played in the movie. JARED GILMAN: I like a lot of rock music. Alternative, Indie, and I also really like Electro and Dubstep a lot. I like The Black Keys, The White Stripes, Kasabian, Skrillex, Noisia, Chemical Brothers. 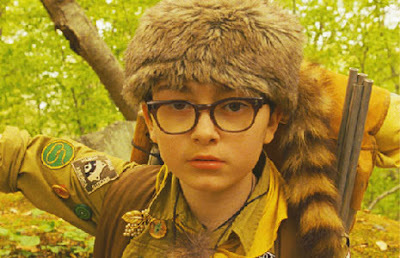 Moonrise Kingdom is in select theaters now. 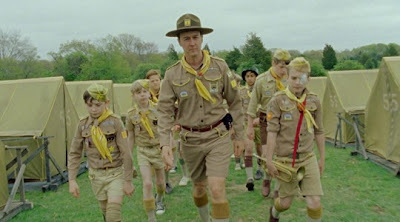 Don’t forget to check out our interview with director Wes Anderson. 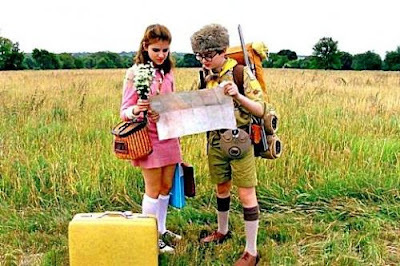 Synopsis: Set on an island off the coast of New England in the summer of 1965, MOONRISE KINGDOM tells the story of two twelve-year-olds who fall in love, make a secret pact, and run away together into the wilderness. As various authorities try to hunt them down, a violent storm is brewing off-shore — and the peaceful island community is turned upside down in more ways than anyone can handle. Bruce Willis plays the local sheriff. Edward Norton is a Khaki Scout troop leader. Bill Murray and Frances McDormand portray the young girl’s parents. The cast also includes Tilda Swinton, Jason Schwartzman, and Jared Gilman and Kara Hayward as the boy and girl.